As they attempt political comebacks, Eliot Spitzer, Anthony Weiner and Mark Sanford all are hoping they can put behind them the headlines about the misdeeds that forced them from office. And, those headlines were numerous: the amount of news coverage their misdeeds attracted ranked among the top five political scandals of recent years. Weiner, a former New York City congressman who resigned in June 2011 following a much-publicized sexting scandal, has decided to make the race to succeed New York City Mayor Michael Bloomberg. And, earlier this year, Sanford, the ex-South Carolina governor, won a Congressional seat about four years after he admitted to an adulterous affair and survived an impeachment effort. Just a few years earlier, all three men faced a barrage of unwelcome headlines, according to an analysis of mainstream news media that included network TV news, newspapers, online news sites, cable news and radio news. When it came to the percent of the newshole devoted to them, the Spitzer, Weiner and Sanford sagas ranked among the top five scandals involving elected officials, according to a Pew Research Center examination of the mainstream news agenda from January 2007 to May 2012. In the week of March 10-16, 2008, when he resigned as governor of New York, Spitzer’s downfall accounted for 23% of the newshole, making it the No. 2 political scandal story in the period studied. (Newshole refers to the space devoted to each subject in print and online and time on radio and TV.) 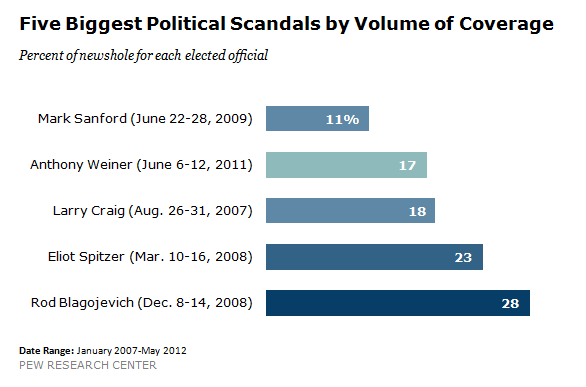 During that week in mid-March, only the 2008 presidential campaign received more coverage (27%). The Weiner story ranks No. 4 among political scandals. During the week of June 6-12, 2011, as key Democrats pressured him to resign, that coverage accounted for 17% of the newshole, making it the top story of the week. And when Sanford admitted to his extramarital affair the week of June 22-28, 2009, coverage of that episode filled 11% of the newshole—placing it No. 5 among scandal stories affecting elected officials. The other two men who made the top five roster are no longer active in politics. After the news broke of the arrest of Idaho Senator Larry Craig for suspicion of lewd conduct in a Minneapolis airport, the story accounted for 18% of the newshole (August 26-31, 2007). Craig did not seek re-election after his term expired. He was recently in the news again when a judge refused to dismiss an FEC lawsuit alleging that he used campaign funds to pay for his defense. But the biggest political scandal when it came to the amount of news coverage involved former Illinois Governor Rod Blagojevich. From Dec. 8-14, 2008—the week he was arrested on corruption charges, including allegations that he tried to sell Barack Obama’s former Senate seat—28% of the newshole was devoted to “Blago’s” legal troubles. Removed from office in 2009 and convicted in 2011, he is currently a long way from the political fray as he serves a 14-year sentence.